Matthew Stafford completed 22 of 33 passes for 217 yards. The Detroit Lions finished the season with another losing record. That makes 12 of the last 13 years in which the Lions have lost more games than they’ve won. 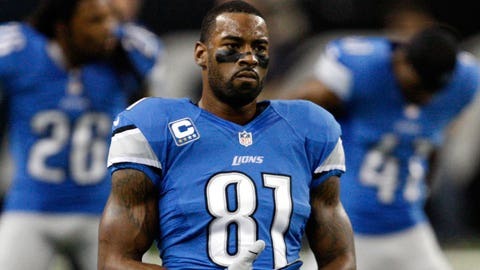 Receiver Calvin Johnson likely will undergo surgery on his right knee after missing the Detroit Lions' regular-season finale Sunday at Minnesota. This time, it took a complete collapse down the stretch to get below .500, capped off by a 14-13 loss to the Minnesota Vikings in Sunday’s regular-season finale at the Metrodome in Minneapolis. The Lions, who started the season 6-3, lost six of their final seven games to finish 7-9, the last three defeats coming by a combined total of six points. Coach Jim Schwartz called Sunday a "microcosm" of the season. "We were one play short and we lost another close game," Schwartz said during his post-game radio interview. The seven wins actually are tied for the Lions’ second-best record during this 13-year stretch, behind only the 10-win season two years ago. The Lions are 60-148 overall over the 13 seasons. During that time, they’ve gone 0-16 once, 2-14 twice, 3-13 twice, 4-12 once, 5-11 twice, 6-10 twice and 7-9 twice. The focus will now center directly on the future of Schwartz and general manager Martin Mayhew. Both are considered on the hot seat coming off a season in which the Lions failed to win a division title for the 20th straight year despite injuries to Green Bay quarterback Aaron Rodgers and Chicago quarterback Jay Cutler. The day after the NFL regular season ends has become known as Black Monday around the league because that’s when most coaching changes are made. The general assumption has been that Schwartz will be among those getting fired for not taking the team to the playoffs, but there are conflicting reports on his status. As for the game, the Lions had no turnovers after committing 21 of them in the previous six games, but they found other ways to come up short again. Both teams were without their marquee attraction – receiver Calvin Johnson (knee) for Detroit and running back Adrian Peterson (groin/foot) for Minnesota. The Lions were coming off the disappointment of having fallen out of the playoff race only a week earlier while the Vikings (5-10-1) have been out of it for quite a while. It was the final game ever at the Metrodome, which certainly helped energize the crowd more than normal for a Week 17 game with zero impact on the postseason. Despite being totally outplayed, the Lions trailed by only a touchdown at halftime. Minnesota had 241 yards offensively to Detroit’s 56 in the first half. An interception by safety Louis Delmas in the end zone helped keep the score close. The game started to turn around in the third quarter when the Lions went 85 yards on their opening possession to tie it up on a 19-yard screen pass to running back Reggie Bush. David Akers then kicked 25- and 53-yard field goals to give the Lions a six-point lead with 12:43 remaining. A few minutes later, however, a 50-yard punt return put the Vikings back in position to regain the lead with an 8-yard pass to Cordarrelle Patterson, his second touchdown of the day. The visitors never answered back. Another day, another frustrating loss, another losing season – that is the Detroit Lions. — Bush is the first Lion to rush for 1,000 in a season since Kevin Jones in 2004. It’s the second time Bush has reached the milestone in his eight years. — The club’s decision to limit Delmas’ activity during training camp and in practices throughout the season paid off in the end. Delmas played in all 16 games for the first time in his five-year career. He had played a total of 19 games the previous two seasons combined because of knee injuries.